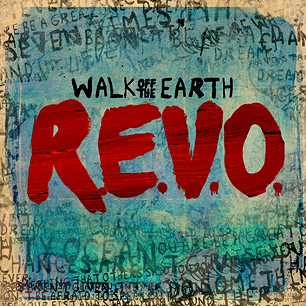 Walk Off The Earth Proves They're Not Just "Some Cover Band That You Used To Know" with R.E.V.O. Comments Off on Walk Off The Earth Proves They're Not Just "Some Cover Band That You Used To Know" with R.E.V.O. You could call Canadian band Walk Off The Earth “the Karmin of 2012,” and you wouldn’t be too far off with your comparison. Like Karmin, Walk Off The Earth built a robust fan base from their online presence, most notably with their impressive covers. Like Karmin, one particular cover erupted in popularity, turning heads across the planet. For Karmin, it was “Look At Me Now” in 2011. For Walk Off The Earth, their one-guitar take of Gotye and Kimbra’s global break-up hit “Somebody That I Used To Know” became overwhelmingly viral in January. It clocked over 35 million views and captured the attention of the national media in just two short weeks. Finally, like Karmin, they followed up their vast array of covers with a collection of slick, fun, and original tunes, a true testament to their worth as a band. That collection is a four-track release titled R.E.V.O. (Realize Every Victory Outright), which dropped yesterday, October 30th. What R.E.V.O. brings is a whole slew of different influences and sounds, all building upon a whimsical indie-rock auditory adventure. In less than 15 minutes, these five multifaceted musicians prove they’re more than equipped for the charts and radio waves. If Walk Off The Earth truly believe in the message in their album title, then they should be patting themselves on the back for creating this EP. This is how the biggest musical careers begin. “Red Hands” is the first quarter of R.E.V.O., pulling out all the stops for a huge, brawny opening track. Xylophone keys and a soft acoustic guitar lead into a wall of bouncing, clannish drums and bright singsong group chants. Vocalists Marshall, Sarah, and Gianni take this opportunity to showcase their diverse singing chops, trading off lines with unstoppable rhythm. The sparkling composition of the track belies its darker message, delving into the pitfalls and mistakes that weigh heavily on relationships. “Gang Of Rhythm” is a cute, quirky song about…well, creating a song. More specifically, “Gang Of Rhythm” is about using the simple yet powerful joy of music to bring people together. Marshall, Sarah, and Gianni chronicle the development of the song as it progresses, and Sarah delivers pure lyric gold when she sings, “the chords will carry on long after we’re gone.” “Gang Of Rhythm” also carries on from “Red Hands” by adding some tribal-like sounds, particularly with the rowdy “HOO-HA” calls that bolster the final chorus in the track. 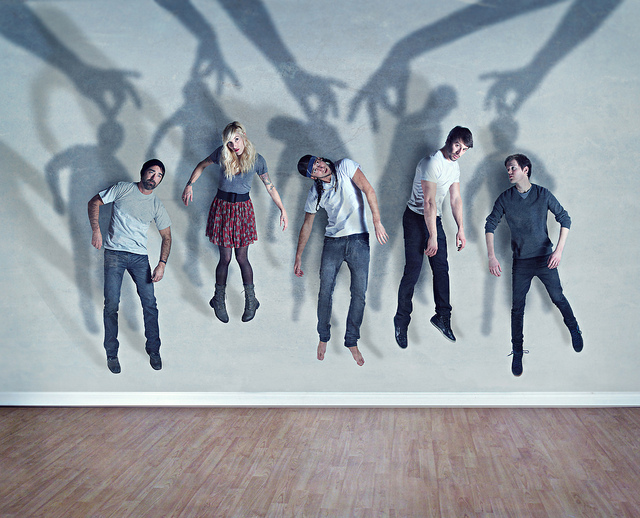 Walk Off The Earth bring in a folk-centered Spanish vibe for “Speeches.” Saucy horns and dusty acoustics blunder across the song’s breadth like tumbleweeds in a desert, with a multitude of instruments joining in throughout the track. A ukulele sputters in and out like a passing rainstorm, a vibraslap rattles like a snake in the verses, and a smoldering violin heats up the bridge. Sugary, ukulele-driven pop comes in hefty portions in the final song on R.E.V.O., dubbed “Summer Vibe.” The title encompasses the track perfectly. Here, Sarah takes the lead on vocals, channeling Colbie Calliat with her silky, hook-driven singing. Soft background harmonies bask upon a lounging harmonica, as the ukulele skips lightly along. The entire track emits breezy, melodic bliss, wonderfully comforting and cool. “Summer Vibe” is the kind of song that makes you yearn for a day on the beach, lying in the sun’s rays, a cold drink in hand as the ocean breeze tickles your face. With so much musicality packed into four songs, R.E.V.O. is a short and sweet precursor to a successful musical legacy for the indie-rock quintet. Support this fantastic burgeoning act by picking up the R.E.V.O. EP on iTunes or Amazon here! You can also stream the full EP on the Rolling Stone website here! PhotoOp: Wiz Khalifa and Amber Rose got engaged today… Look at this rock!